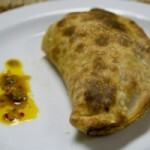 I have been inspired lately to explore empanadas and master the Argentinian style pastry. Traditional empanadas from Argentina are baked or fried with white flour and, when done well, come out with a beautiful flaky texture and have plenty of filling without being hollow or greasy. I have had empanadas in many restaurants in Costa Rica, such as Donde El Ché, and have been enamored with how beautiful and delicious they turn out. This post is to fill everyone in on the mistakes I’ve made and discovered throughout my exploration in search of the perfect dough and filling recipe. I’d like to share with everyone some tips and tricks as well as things to avoid when making empanadas. Has anyone else had as much trouble as I have getting things right? Once you’ve read the tips below, make sure you try out the recipes I’ve posted for vegetarian empanadas, chicken empanadas, beef empanadas, seafood empanadas or ham empanadas. • Never, never, never use processed doughs if you want true empanadas. This is a shortcut that’s not at all worth it in the end. Once you make your own successfully, you’ll never seek out Pillsbury again. • When using a recipe with baking powder, know that your empanada will grow in size, but will be very hollow inside. I prefer to have a pocket full of filling rather than air. • Never use more than one stick of butter or 1/2 cup of shortening for every three cups of flour or you’ll end up with dense, crumbly dough. • Know that when you have a dough recipe with yeast, you’ll end up with a different texture more like pita bread. If you like this type of dough, great. But don’t expect a recipe with yeast to produce authentic results. • Jazz up the dough by adding your favorite fresh, dried or powdered herbs and seasonings to the flour before mixing. My favorites include fresh cracked black pepper, crushed red pepper flakes, ground oregano, cumin and garlic powder. • For baked dough use very cold butter and for fried dough use solid shortening. • Never use oil as this will create undesirable texture of the dough before rolling it out. • For baked dough, always use ice water, never lukewarm or hot. • For baked dough, always refrigerate the dough ball for at least 3 hours before assembling your empanadas. • Make sure your filling in not too watery or juicy or it will make the dough soggy. • To reduce the moisture of your filling, place it in a fine mesh strainer for at least an hour. • It is a good idea to let your filling cool or even refrigerate it before assembling. Using warm or hot fillings will degrade the dough before baking/frying. • The best fillings use high quality meats, produce and cheeses. Don’t skimp on quality. • You need about 2 cups of filling for 12 empanadas. • Only place 2-3 tablespoons of filling in each. 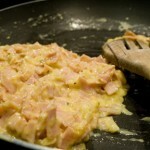 • Filling ingredients should be in small or fine pieces for best results. • Slow-cooked fillings are no-fail. Remember to let the filling cool before using it. 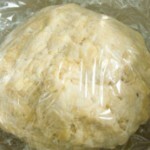 • Roll out the dough on a floured surface without using plastic wrap, parchment or waxed paper. It’s easier to work with the dough on a simple cutting block or countertop. • Extremely large circle cutters make it difficult to assemble, I stick to 6-8″ circles. 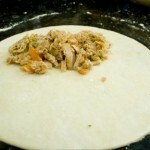 • If your empanada dough is correct, you don’t need to wet the edges to seal them. • It’s always a good idea to roll out a new piece of dough if you put a hole in it by accident. • There are many different techniques and styles for closing empanadas and here is a great video that demonstrates many. The family is Latin-American so everything is spoken in Spanish, but she does a great job showing a variety of ways to form the final empanada. I wish that I had seen this website before attempting the empanada dough. I appreciate your website and I am sure my next batch of empanadas will be much better. My mistake was to substitute butter(which is what the recipie called for) for coconut oil. My dough cam out grease and cumbly. post is just nice and i can think you are an expert on this subject. This was my first attempt, and I am making quite a few empanadas for a church function. I love to cook so this is an adventure. My original reason for opening this post was about baking powder in some recipes and not in others. Your list of “failures” was very helpful to me. Happy to say that I had chosen to use a recipe that used the ingredients that meet the qualifications for good end product. Thanks for sharing your learning experience. 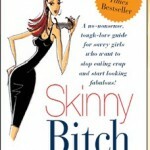 Hi, this has been really helpful! Just curious about other recipes that call for using food processors to mix the butter into the flour. What is your opinion on that? Wow what an informative site . Wish I had seen it first. I have a lot of filling left. No more dough. Can I save it over night in fridge in a container? I keep reading only three hours but it’s hamburger meat and seasonings so not sure why. I am also excited to seal them different then with a fork. So much nicer. Hi sandee. I think you should be fine freezing the filling. When you thaw make sure to drain out any excess liquid so your empanadas don’t end up soggy. Hi..I’ve been trying to make “still crispy” empanada doughs (fried) even when cooled. There’s a store near our office that sells just like that but I never got the chance to ask how they do it. I think their empanadas were consigned only. I’m thinking of adding eggs or maybe put less shortening.. Will be thankful for your answers. God bless! we made empanadas today and they’re really good the filling is great but the crimped edges seem a little bit crisp like, almost crackery is there a way to prevent that? depending on how thick your edges are and if you’re baking or frying, it’ll make a difference in how crispy/brown the edges get. Thicker edges will brown less and if you back down the heat and cook longer, that might help as well. Good luck!